Successfully Added 4K Android 5.1 TV Box – Amlogic S905, Wi-Fi, HDMI 2.0, Kodi, 3D Support, Miracast, Airplay, DLNA, Bluetooth 4.0 to your Shopping Cart. Get the best entertainment for your home! All it takes is a small TV box that will take minimum space and yet help make the most out of your TV experience. Packed with Android 5.1 operating system, Amlogic S905 Quad Core CPU, Wi-Fi and Bluetooth connectivity, 4K output and more, this Android TV box will completely transform your home entertainment system. Get all the benefits of Android on the big screen. This compact TV box comes with Android 5.1 and lets you enjoy a responsive and intuitive interface right on your TV. You can upgrade your TV box further by simply getting more apps and tools from the Play Store. With Wi-Fi and Bluetooth 4.0 connectivity, the TV box will efficiently communicate with other devices and you will have the powerful Amlogic S905 Quad Core CPU to back up all your fun and multitasking. When it comes to your viewing experience, this Android TV media player comes with 4K output, letting you watch the latest blockbusters with the video quality they truly deserve. You can store content right on the TV box with its 8GB of internal memory – or extend that further with the 32GB SD card slot. Thanks to H.265 decoding, your files will be efficiently compressed and thus not take up to much of the valuable storage space. 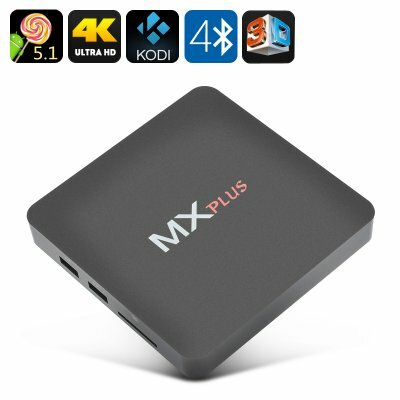 The TV box supports Miracast, Airplay and DLNA and comes with pre-installed Kodi version 16.0. With the open source media player, you will be able to get your hands on even more content from large online repositories. With lots of video and audio formats supported, you will be able to play pretty much any file you need. The Android smart TV box comes with an IR remote for convenient control of your entertainment. The 4K Android 5.1 TV Box comes with a 12 months warranty, brought to you by the leader in electronic devices as well as wholesale Android TV boxes..